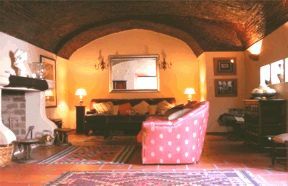 Accommodation in Casa de Terena. Forming part of the historic centre of the old town of Terena, this restored 18th Century house is 50 metres from the Castle. Casa de Terena is in Alto Alentejo not far from the Guadiana river which forms the eastern border of Portugal with Spain. In days gone by it was the administrative headquarters of the area but nowadays it is in the district of Alandroal. The town of Terena was granted by royal deed to Chevalier Gil Martins in 1262 during the reign of Dom Alphonso III. The nearby castle was built during the reign of King Dom Dinis and was enlarged during the 16th century. It formed part of the defensive line between Portugal and Spain. From the ramparts there is a magnificent view over the surrounding Alentejo countryside. 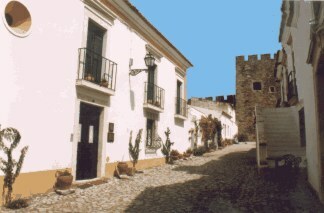 The historic centre of the town and its narrow streets lie between the castle and the parish church of St. Peter. Nearby, the river has been dammed to provide a magnificent lake called Lucefecit where you can swim, fish, canoe, go boating or windsurf. Casa de Terena has two canoes at guests disposal. In the house, there are six bedrooms available for guests, all ensuite (some with shower, some with bath). All bedrooms have TV and central heating. There is also a lounge available for the use of guests. Dinner can be arranged for a small charge, either in the dining room or outside. Decoration includes a wide selection of artifacts from the world over, which coupled with an open log fire provides an extremely welcoming and interesting atmosphere. On our visit, we enjoyed a wide selection of regional bread and cheeses with homemade jam. Nearest golf courses are approximately 30 kilometers (19 miles) away. 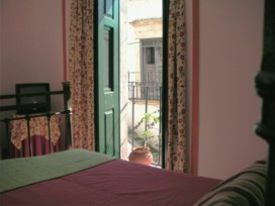 We stayed at Casa de Terena in September for one night for our wedding anniversary. Well...... what a fabulous place, the host was so welcoming and even cooked and served our evening meal which was yummy with extra portions for my husband!! Our room was lovely, clean and spacious with a marvellous view of the countryside and our very own cockerel woke us in the morning. Breakfast was cooked to order and I would have no hesitation in recommending this hotel to anyone who wants a quiet and authentic Portuguese experience.